These are great! My twin grandsons love them as well as their Dad! And yes, I think they’re quite tasty, too! Thank you! Was the mixture supposed to be almost dough like?? It just disnt seem like enough liquid it was the consistency of a batter at all. They came out very dense. Any idea of what I may have did wrong? Hello! Glad you tried Applesauce Puffs. Sorry it didn’t turn out so well for you. I reviewed the recipe (and I have made these multiple times myself) so the only thing I can think of is maybe you forgot an ingredient. The applesauce, milk, egg and oil should be enough to produce the proper batter. My suggestion would be to try it again. Thank you for this recipe!! My son LOVES these. This will do wondees for the school week. So I have made these a few times I use a whole wheat biscuit mix I make and I omit the sugar and add more puréed fruit such as banana peach what ever I ahve around also I use olive oil instead of canola. I love them and so does my 13 month old! I love it when when readers comment with how they adjusted the recipe for their family’s needs. It helps others to make changes as well. Thank you so much! Also, thank you for the 5 stars! I appreciate it! I need to scale this for a large family. Am I reading it currently makes 9 regular size muffins? Thanks so much!! Yes, I just made them again for my family and it was 9. Hope you enjoy them! These were delicious. I made them for company. Very moist and I am a cinnamon lover. I may try adding small bits of apple next time but great as is!!! Thanks for a delicious recipe that is so quick to put together. So glad you liked them! They are a favorite of ours! These are a favorite at our house!! We use the mini muffin pan! Would you happen to have the calorie count for these? What is T for the oil. Tbsp or tsp? It is Tablespoon–hope you enjoy them, our family does! Can’t wait to try these! 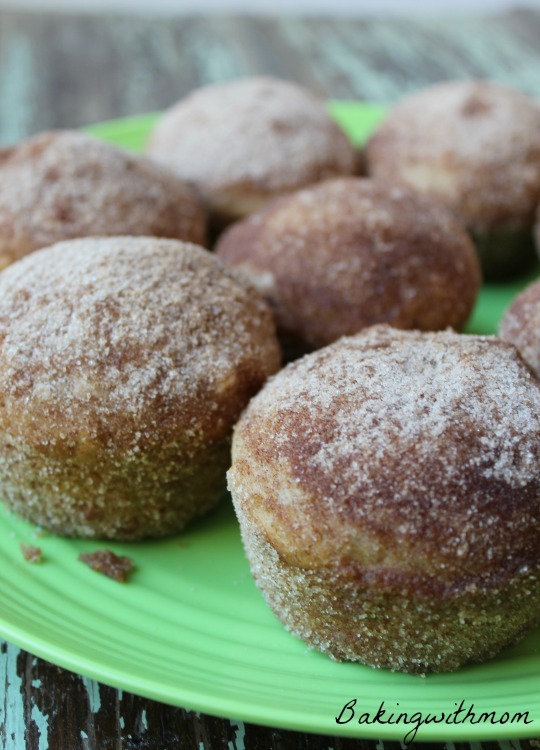 My kids love muffins so im always lookong for new ways to make them. They are delicious! I hope your children like them mine certainly do! Can you fry this batter? Maybe a TBS. for each puff? I do not know. That would be interesting. I would say no, because it is more of a muffin then something that could be fried, but I don’t know. Maybe I need to try that! Well, I am not really sure. You could try not to use an egg and see how it turns out. I know I have ran out of eggs sometimes and just not put one in the recipe. Sometimes it works, sometimes it doesn’t. 🙂 I also know some use Flax Seed as a substitute, though I have never tried. Hi Can I use pancake mix instead of biscuit mix? I do not have any biscuit mix on hand. These look delicious! I have made these and they are very good!! My kids LOVE them!!! Thanks for the recipe!!!! How did they turn out with pancake mix? I personally haven’t used a pancake mix and I haven’t heard if it worked or not. I say give it a try. I think it would work fine! I just made these muffins with pancake mix. I just did not add the 1/4 cup of sugar to the mix because pancake mix is sweeter than a biscuit mix. They turned out great! 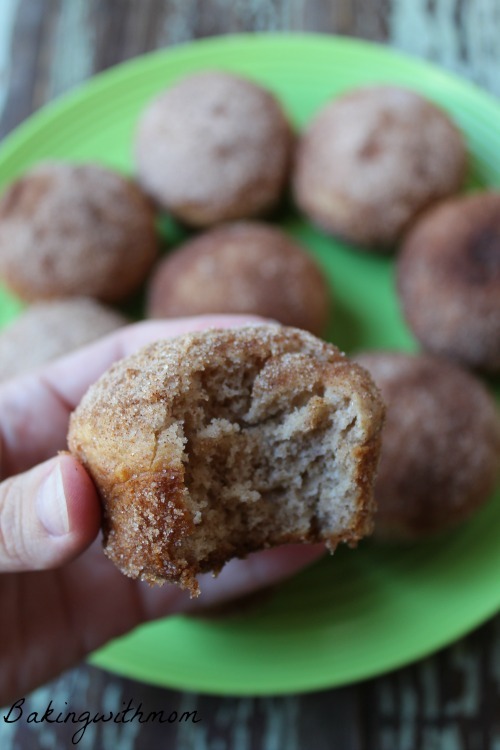 I made them in the mini muffin pan. I also used almond milk and olive oil for substitutions. I will make these again. Thanks for the recipe. You are welcome! I am glad to hear it worked out for you. Thanks for letting my readers know! Have you tried freezing these before adding the sugar topping? I like to make breakfast items for my toddler that I can freeze and use when in a pinch! Thanks! Yes, they will freeze great! Just be sure not to add the butter/sugar topping before freezing. Add that when you are ready to eat them. 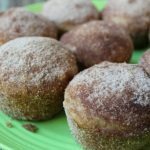 My children love these muffins! How can i make these without biscut mix? what can be substituted? If you want to replace the biscuit mix, try 2 cups of flour, 3 tsp baking powder and 1/2 tsp of salt. Hope that helps! Thank you for the recipe. I look forward to making it for my two toddlers in the morning for their breakfast. I know my 1.6 year old will love them because she’s not as picky but my 2.7 year old is extremely picky. She will only eat about 5 things. Sadly it makes it hard to enjoy cooking new things. But I still try. I look forward to using the non-biscuit mix ingredients you just listed. I made them that next morning for my babies. I made mini muffins so instead of rolling them in the sugar/cinnamon, I brushed the butter on and then sprinkled them like you would a pinch of salt. They were delicious. So easy to make. Both girls liked them and my picky eater even ate one. Which even just one is a miracle. Thank you!!! I’m so glad! Thanks for the update. Mini Muffins would be a great idea! Is there a gluten free option-would almond flour work as a base? I really don’t know gluten free options that well. I wouldn’t want to tell you the wrong thing. If you try it, let me know and I will add it to my post! There are several gluten free biscuit mixes available. Even Walmart sells one, and its excellent! Thank you for sharing! That is great to know!! Would these taste good served the next day? Did you use a regular muffin tin or mini? I used a regular muffin tin. I was thinking about making this with a mini muffin tin sometime, just haven’t yet. It would be great for school lunches!